StarkhafnRRE is held in fief by Their Excellencies Robartach and Gyda. Meaning: "Stark" for the desert, "hafn" for haven or home. Established: Approximately 1980 in West Kingdom. Became a Barony in October 1982. Flame: Baronial herald's title reflects the principal charge on the arms. Flame Pursuivant: Barnial heraldic title registered to Starkhafn in December 2003. Flame Pursuivant Extraordinary: Baronial heraldic title registered initially to Caid April 1981, and subsequently transferred to Starkhafn in December 2003. Order of the Stjarna of Starkhafn (Star): Baronial Arts award. Order of the Steinn of Starkhafn (Stone): Baronial Service award. Order of the Hoeverska of Starkhafn (Feather): Baronial Martial awards for forms other than armored. Order of the Ulftönn of Starkhafn (Wolf's Tooth): Baronial Armored fighting award. Order of the Desert Bloom of Starkhafn: Baronial award in recognition of such acts of selflessness, chivalry, and honor. Giving of one's self in a manner far beyond that which is expected. Order of the Ambassador of Courtesy of Starkhafn: Baronial award for those who share the unique spirit of Starkhafn with others within the Known World. Order of the Sparkes of Starkhafn: Baronial youth award. Starkhafn Polling Orders: The Barony has four polling orders, bestowed by the Baron and Baroness based on recommendations from members of the different Orders. Members of the Orders are polled at Starkhafn Yule, in consultation with Their Excellencies, to determine those individuals who may be worthy of recognition. New members of the Orders are traditionally elevated at Starkhafn Anniversary. Order of the Flame of Starkhafn: Baronial service polling order for superior service to the Barony over a span of years. 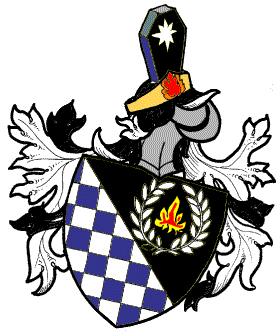 Order of the Augmented Flame of Starkhafn: Baronial service polling order exemplary service and dedication to the Barony. Order of Saint Illuminatus: Formerly known as "the Illumination," Starkhafn's arts polling order for "excellence in a particular art or scientific endeavor, teaching, mentoring, and sharing that art or science with others. 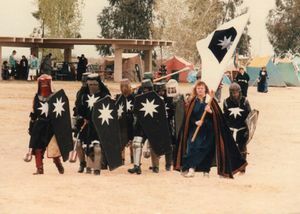 Order of the Defender of the Flame: Starkhafn's Baronial martial arts polling order for those who have brought honor to themselves and the Barony through continued excellence in one or more martial arts. This page was last modified on 13 January 2019, at 06:16.